Have you ever tried solid shampoo? You may not have previously considered this alternative, but it works as efficiently as the bottled variety and has a reduced environmental impact—if you could get your hands on it, you might just give it a try. 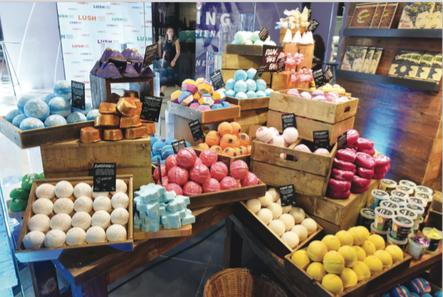 The idea of giving consumers ethical options to choose from, and educating them on the advantages of these products, is at the core of Lush’s business strategy. As well as formulating, manufacturing, and retailing a range of skin care products and cosmetics, the UK-based brand supports grassroots projects around the world and sources its raw materials as ethically as possible from various countries, including Lebanon. In May, Rowena Bird, one of the co-founders of Lush Global, visited Lebanon to check in with the company’s local stakeholders. The beauty industry is often taken to task for its ethical blind spots, but some companies are working to change this perception. All Lush products—such as the solid shampoo bars, which require no packaging and last for months—are 100 percent vegetarian, 74 percent vegan, 65 percent self-preserving, and 60 percent free of wasteful packaging, with no animal testing done on any product or ingredient. The brand is constantly innovating to formulate effective products that respect nature and people. Lush, Bird tells Executive Life, is “good for the skin, soil, and community.” She explains: “We are a cosmetics company, but we are a campaigning company too. There are a lot of issues we care about, and that translates through to our product innovation. Making small changes in your routine can have a massive impact on the environment.” Educating customers to allow them to make informed decisions is an essential part of the business, she says. T he brand just opened its fourth boutique in Lebanon, at ABC Verdun. This latest store joins other Lush locations in ABC Ashrafieh, ABC Dbayeh, and Beirut Souks. In addition to their retail presence, Lush is now beginning to source raw ingredients for their internationally-sold products from Lebanon. Olive trees in the Bekaa are one of the company’s sources of olive oil (other sources include Palestine). Likewise, plans are in place to source neroli oil, a pricey essential oil extracted from orange blossoms, from Bioland in Batroun. Securing this product will take years, Bird says, but she puts emphasis on the importance of long-term thinking. Lebanon is perhaps unusual in that it is both a source of Lush ingredients and a market for Lush products. “We sell fresh cosmetics, but if you don’t have enough buyers, you can’t keep them fresh so they get wasted,” Bird says. “Therefore, we only have stores in countries where we can have a turnover and we’re not wasting.” Many less wealthy potential producing countries are thus unable to support retail outlets. Lush also aims to support other organizations in their ethical endeavors. The American University of Beirut’s Nature Conservation Center was shortlisted this year for the annual global Lush Spring Prize for their multidisciplinary projects. The prize is part of the Sustainable Lush Fund—an initiative launched 10 years ago that annually allocates 2 percent of the company’s income to invest in and experiment with suppliers around the world. So far 20 million pounds (roughly $26 million dollars) has been invested in 36 countries, mostly as small donations to grassroots projects. The fund is more of a partnership than a donation, adhering to the “teach a man to fish” mentality to avoid dependency. Rather than buy land and develop it themselves, Lush establishes relationships with locals who know the land and climate. The idea is to help growers produce food and value-added products for the domestic market, while also selling a portion of their product to Lush and other international buyers. “We are spending a little more money but spreading the risk and helping a community,” Bird explains, noting that this system also affords Lush opportunities to learn from other cultures and other people’s expertise. “The process educates us and gives us a window into understanding where our markets are, where the resources are coming from, and it connects us with people doing amazing things,” she says. The company’s efforts around the world are making a real impact. In Japan, Lush is helping farmers in Fukushima—which was affected by a 2011 earthquake, tsunami, and resulting nuclear disaster—by buying rapeseed oil from the area for their products. Rapeseed is thought to have a cleansing effect on soil, the plants soaking up toxins without affecting the product though this has not been conclusively proved. Thus, Fukushima farmers, who were left struggling with contaminated soil are now able to earn an income by growing a plant that is also, theoretically, purifying their land. In Lebanon, Lush is supporting two Lebanese NGOs in their environmental projects. The Society for the Protection of Nature in Lebanon (SPNL) is creating a butterfly sanctuary in West Bekaa to preserve the creatures and educate the public about them, as well as aiming to stimulate the local economy by creating jobs. Meanwhile, the NGO SOILS is developing a beekeeping project dubbed Afeer (Beehive) in Saydoun, near Jezzine, to provide multifaceted information about bees and to preserve bees and their environment. Lush plans to soon change the name of its fund to steer away from the word “sustainable” in favor of “regenerative.” Being sustainable, the rationalization goes, is not enough, and regeneration is increasingly urgent. “We want to make a difference, but it also makes business sense, because we use ingredients that are a finite resource, so we want to support and invest in projects that are putting more into the earth,” Bird says. But Bird is realistic. She admits that, as a business, Lush has to make a profit in order to sustain itself and its network of suppliers. After 23 years in the sector, with over 900 stores in 49 countries, the company is evolving. They are now taking into account additional factors, such as digital ethics for their e-commerce platforms, and embarking on new initiatives, like creating easy recycling channels for clients to bring back used packages in exchange for a reward.